Three of the most striking failures of the 1986 season captured in one picture: Johnny Dumfries, Philippe Alliot and the Brabham-BMW BT55. The first one was victim of a career demolition machine named Ayrton Senna. Alliot was the supremely disappointing replacement of Jacques Laffite, who before his unfortunate British GP smash did wonderful things with the best Ligier for years whereas Alliot emphatically did not. The BT55 was Gordon Murray's sublime disaster, the star designer reaching for the stars with his low-line design but instead sinking down into a dark sea of non-finishes and even death. Dumfries' failure was no doubt the saddest of the three, since he was the only one not to get a reprieve in F1. In Alliot's case, there was always a French team around to give Philippe yet another break, despite his mediocre talent - in an age when the number of entries was soon to peak at 40 it seems someone always had a seat left for the Frenchman. And there was someone else giving Gordon Murray his break. At McLaren, Ron Dennis allowed Gordon's low-line thoughts to sink in with chief designer Steve Nichols, the pair coming up with perhaps the most dominating GP machine ever, the McLaren-Honda MP4/4. Johnny Dumfries, however, was the residu of Ayrton Senna's grinding mill, and he remained so, left with absolutely no chance to rejoin Grand Prix racing. Yet with his aristocratic background John Colum Crichton-Stuart, Earl of Dumfries, had provided a colourful addition to the F1 circus. Royals and other blue-blooded members of the aristocracy have always been around in motorsport ever since the very early days of competition. The reasons were obvious since not many folk beyond the noble and the rich could buy a motorcar for competition in the early 1900s, let alone for private use. Carel Godin de Beaufort, Wolfgang von Trips and Siamese prince "B Bira" are only a few of the later names to crop up in World Championship racing proper. Sadly these three all died under tragic circumstances. "Taffy" von Trips was killed in his sharknose-Ferrari 156 at Monza during the 1961 Italian GP. Count Carel Godin de Beaufort crashed his Porsche 718 during qualifying for the 1964 German GP at the old Nürburgring. "B Bira" escaped death in a race car but died forgotten in 1985 at the Earl's Court subway station in London. In fact it took days before the elderly man was identified as the royal he was. Then, in 1986, in an age when Grand Prix racing had become synonymous with the FIA Formula 1 World Championship, the playground for 25 to 35 talented men (some of them hugely talented, others hugely sponsored), came Johnny Dumfries. It was his single year in F1, and he wasn't even supposed to be there. In fact, Johnny's Lotus team had another Briton in mind to partner their new lead driver Ayrton Senna, who had used the 1985 season to slowly shoefork his team mate Elio de Angelis - a six-year Lotus member - out of the number one seat within the team. The ever political Brazilian succeeded conclusively and Elio sought refuge with Brabham, themselves in need of a new number one, now that Nelson Piquet had finally got himself into another World Championship mount at Williams. 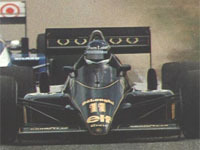 The man Lotus had pencilled in for the No.11 car was Derek Warwick. One year earlier, Derek had already missed his big break, believing his short-term prospects with Renault were better than a long-term future with Canon Williams Honda. So Williams signed their number two choice, who went on to win his first two Grands Prix in a season Warwick thought was going to be marred by terrible Honda reliability. Senna felt his exclusive number one position in Team Lotus would be threatened by the underrated but extremely talented Warwick so the Brazilian exercised a contractual veto against the signing of Warwick. Senna even threatened to leave Team Lotus for Brabham - following De Angelis! - in case his veto wasn't honoured. Needless to say, the Chapman-less Lotus team, now headed by Peter Warr, were impressed and duly gave way - which looking at the wins Ayrton gave them wasn't entirely unjust. The upshot of it all was that Derek Warwick had no Renault team to go back to, forcing him to look to sportscars. Then, in a cruel mid-season twist of fate, Derek became the one to go to Brabham, not following De Angelis but replacing him. Meanwhile, Lotus were still without a second driver. To "help" the team solve the matter Senna then promoted his compatriot and close friend Mauricio Gugelmin for the number two seat. In the end, Ayrton didn't get all his wishes granted as Gugelmin was deemed too inexperienced by the team. They had a case in hand since Mauricio was not to get his F1 break until two years later. But then they signed rookie Dumfries. Dumfries' boyish looks fooled many but Johnny was already 28 by 1986. He did however earn his seat by merit as he had already logged many miles in a GP car before he got the 1986 race seat at Lotus. Back in 1984 Johnny had been crowned British F3 champion, driving a Ralt RT3/83-Volkswagen for Dave Price Racing. He finished the season with 106 points and scored 10 wins. Runner-up was Canadian Allen Berg on 67 points. The blue-blooded Scot was on his way to the double in 1984 but he eventually finished second in the European Formula 3 Championship on 53 points, Ivan Capelli taking the title on 60 points. Thanks to his four wins Dumfries finished ahead of Gerhard Berger, who scored 49 points. 1984 had also seen Johnny sample a Lotus-Renault 95T at Donington Park as his testing skills were highly regarded. 1985 saw Johnny share his driving duties between an Onyx March 85B and a works Lola T950 in the inaugural F3000 International Championship. He was also employed by Ferrari as a test driver. 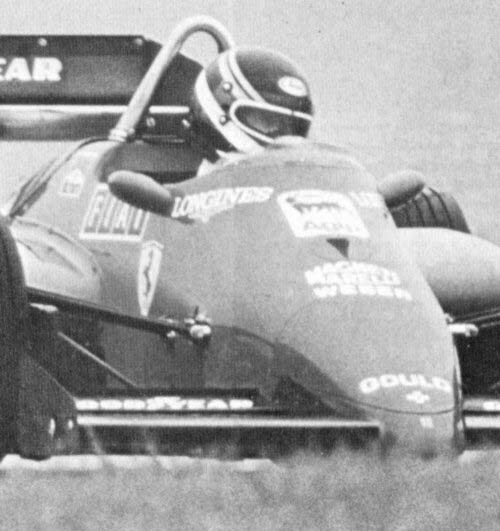 There was little success in the F3000 championship but by the end of 1985 Johnny had already logged miles in a Grand Prix car for Brabham, McLaren, Lotus, Williams as well as his Ferrari duties. So, in spite of being a rookie, he was well-prepared for his entry at the highest level. Johnny had a promising debut for Team Lotus in Brazil. He was a fine 11th on the grid and set fourth fastest lap. Some mid-race confusion in the Lotus pits meant that he was unlucky not to score points in his premier GP. Dumfries' Lotus had developed a misfire mid-race and he arrived in the pits just at the time that Senna was about to pit for new tyres. The pit crew promptly changed the tyres on Johnny's car and sent him out again. Next time around the pit was occupied by Senna and Johnny had to struggle around another lap with the misfiring engine before being able to pit again. During the third stop in as many laps the misfire was swiftly dealt with but Johnny's chances for a point-scoring finish were gone. Unfortunately, Brazil remained the highlight of Dumfries' season. The early promise shown at Jacarepagua wasn't quite fulfilled and the rest of the season was not on par with his debut drive. An early accident during qualifying at the twisty Monaco track meant that poor Johnny even had to put a DNQ on his 1986 resumé. On a track he knew well Johnny was again inside the top-ten during qualifying at his home GP at Brands Hatch. He finished the race just outside the points in seventh place. In our picture we see Johnny at the start of the German GP at the Hockenheimring, in his evasive action to the Johansson/Fabi accident to the left of him. His race was over when he pitted for fresh tyres while lying 7th. His pit crew detected a holed water radiator. On equal terms with all the other drivers on the grid Johnny drove a solid race at the new Hungaroring track for the inaugural Hungarian GP. A eighth position on the grid was converted into a fine fifth place in the end. In the penultimate race of the season at Mexico Johnny was again plagued by problems, which had led to a lowly 17th grid position. He was out by lap 14. As a contrast Johnny's team mate Ayrton Senna had put his similar Lotus on the pole for the seventh time that season. On his way to third place Senna passed the radar at 215.228mph - equal to 346.302kph… Despite a relatively draggy car the ultra-high turbo boosts of the mid 1980s helped to overcome that! This race was also last time we saw the famous JPS colours on the Lotuses. For next year it would all change. For the 1987 season the cars would be in an unfamiliar bright Camel yellow, and more importantly Honda engines had been secured. The Honda engines however came thanks to the courtesy of Japanese veteran driver Satoru Nakajima. So Johnny was elbowed out of the Lotus team. He had talks with Zakspeed for 1987 but they eventually signed Martin Brundle and Christian Danner instead. Johnny had to look elsewhere and he chose the popular option for washed out Grand Prix drivers: Group C racing. 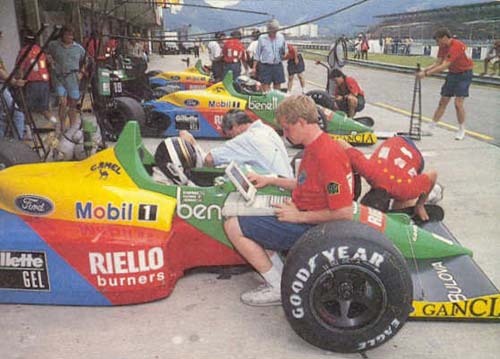 But as he was also remembered for his renowned testing skills he signed a testing contract with Benetton as well. In sportscars he was entered in a Sauber C9 which he shared with the enigmatic Mike Thackwell and none other than the present CART team owner Chip Ganassi, for his first Le Mans in 1987. The transmission lasted only 37 laps on this occasion. Johnny's finest hour came during next year's 24-hour race at Le Mans when he scored a popular win for the TWR Jaguar team. His driving partners were Jan Lammers and Andy Wallace. 1988 also saw Johnny return to competitive single-seater driving when he replaced Le Mans co-winner Wallace in the GEM Motorsport Reynard 88D for the last races of the season. But in the ultra-competitive F3000 championship Johnny seemed lost as he did not have any strong showings. The Toyota years of 1989-'90 did not bring much for Johnny in the way of results. Unreliable cars and strong opposition from TWR Jaguar, Sauber-Mercedes but also - no doubt much to the dissatisfaction of the Toyota people - the improving Nissan cars prevented that. A seventh place at Jarama and an eighth at Spa-Francorchamps were Johnny's poor rewards. His final appearance at Le Mans came in an ancient Porsche-powered Cougar C26S. The flat-6 expired on lap 45 and with it the Earl of Dumfries faded away from the big scene. At the 2000 Festival of Speed Johnny - in the art business nowadays and himself a talented painter - put on a new set of overalls, these being fire-proof again, as he reacquainted himself with his Le Mans-winning Silk Cut Jaguar mount. A happy rendez-vous with his erstwhile team leader Jan Lammers preceded a spectacular run up the hill - or rather, towards the hill, as Johnny missed his breaking point at Molecomb, the sharp lefthander turning towards the hill ascent. The Big Cat slid off straight ahead and comprehensively thumped the hay stacks. Johnny climbed out and raised his hands towards his helmet in despair but fortunately the XJR9 proved much more durable than the Maserati Birdcage that had gone off a while before and was towed away with a severely bent nose. This time, however, the straw bales suffered more. Johnny will have happily returned to his painting. John Colom Crichton-Stuart, the Earl of Dumfries, preferred to make it in his own right, so stuck with the more basic “Johnny Dumfries.” Ironically, it seems, his career lost momentum through lack of adequate backing. In 1980 he made his start, driving karts, and in 1981 it was on to Formula Ford. His ability was sufficient that he moved to F3 with Dave Morgan, two years later. Then, in 1984, he really blossomed with the Dave Price Racing / BP Ralt-VW. From the first seven rounds of the British series, he won six and had one second place. That pretty much set him up for a dominant display, and he was able to fit in plenty of rounds in the European championship, where he also challenged for supremacy against such talents as Ivan Capelli and Gerhard Berger. Four wins and two seconds got him within four points of the victorious Italian, whilst four more wins at home won him that title by a crushing margin. This led to a ride with Onyx in F3000, but he only managed to score a single point, at Vallelunga, and he was let go early. Having done some testing for the Lotus F1 team, however, a better chance opened up for him in 1986. This came about when Ayrton Senna told the team that he would not accept Derek Warwick as his new team-mate, following the departure of Elio de Angelis to Brabham. The Brazilian reasoned, quite possibly correctly, that Lotus were, at this stage in their illustrious history, unable to properly field two competitive cars that could challenge for good results. It may not have seemed that way to Warwick, but Senna probably felt it would be unfair for a driver of his talents to be saddled with the second rate equipment. And, of course, he was also trying to make sure that efforts would not detract from his own prospects. Therefore a rookie team-mate was just what was called for, and Dumfries was offered what would obviously be the number two seat at Lotus. So it proved, with Senna scoring 55 points and two wins, and Johnny managing only three points. In Hungary he qualified in a best for him of eighth (in the next race, this was Senna’s worst grid slot), and came home fifth. He had a sixth in Australia, two sevenths and two ninths. For 1987, it was all change. Lotus secured a second supply of the Honda engines already used by Williams, and a condition of this was to give the second seat to Satoru Nakajima of Japan. After one season, Dumfries was out of F1. He would do some test driving for Benetton, but then it was into sportscar racing with Porsche, Toyota, Jaguar. He won Le Mans in 1988. As for Alliot, he spent a great deal more time as an F1 driver, but with precious little reward - seven points in more than 100 races. Whilst capable of a blindingly quick lap time, he was never the complete article, ‘erratic’ being the best word. Like de Cesaris and Jarier (perhaps), the speed wasn’t always there, and sometimes a crash wouldn’t be far away. F Renault, 1976-78, F3 1979-82, F2 1983. He then spent two years in the uncompetitive RAM, he was in a useful car when he took over Ligier of injured Laffite (1 pt), got three 6ths in the non-turbo Lola ’87, with Lamborghini V12 in ’89 he qualified in the top 8 four times, before he got stuck in a slow Ligier He was two years away from F1 and took wins in Peugeot sportscars, before a return to Larrousse gave him a 5th at Imola. For 1994 he became the Peugeot-appointed McLaren test driver and did one race for the banned Häkkinen and one for Larrousse before a switch to Touring Cars. Warwick was rated as a better prospect than Mansell in the early eighties, but never had the same break as his countryman. After three years helping to build up the momentum of the turbo-charged Toleman-Harts, culminating in nine points at the end of 1983, he moved up with the chance to go to Renault. In two years, the team gradually slipped further away from the form that had helped Prost challenge for the title, and Warwick never got the win that had seemed inevitable after a strong first race. Without a drive as 1986 started, having missed out at Lotus (see above), he was soon to find a place at Brabham after the sad death of de Angelis in testing. The closest he came, thereafter, to the heights of his seventh overall in 1984, was with Arrows in 1988. At this stage, the team had the strongest turbo car outside of McLaren and Ferrari, but with competition from the ‘atmo’ brigade, as well. A string of points finishes took him to equal seventh. He got to Lotus in 1990, but their best days were long gone, so then it was into sportscars (and great success) before an F1 revival in 1993. Currently his Triple Eight Race Engineering runs the Vauxhall Vectras in the BTCC, which he himself drove in '97-'98, with a win at Knockhill.